Over the last few days, something very exciting has been happening in the Arizona desert. Something that has been anticipated for months. Something that means that summer is on the way. 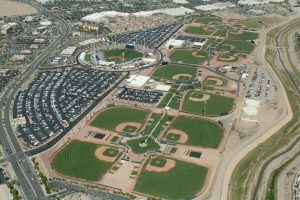 That something, of course, is the beginning of Major League Baseball Spring Training. As players warm up for the season fans everywhere start to get an idea of what they have to look forward to in the coming season. Will their team be as good as last year? Will they make some much needed improvements? Will they completely disappoint? While most fans know not to put too much stock in Spring Training, it is still an exciting time! Not only does this give fans a chance to check out their team, but their opponents as well. You may be aware that the 30 MLB teams are divided into six divisions and because of this, every team has four main rivals. Which, for the “less competitive teams” presents an opportunity to still get some enjoyment out of an otherwise disappointing season by taking on the mantra of “I’m happy as long as Team X loses.” Though your team may not be winning, you can at least be satisfied to see your opponents fail. With baseball, this is rather innocent, but when it moves out of the realm of sports fandom, we get into dangerous territory. The book of Amos, written a few years before a good portion of the Israelite people were destroyed, begins with a series of judgments on their enemies. No doubt, when Amos was giving these prophecies, his audience (the blissfully-ignorant, soon-to-be-destroyed Israelites) would have received this news the ancient Hebrew equivalent of “Preach it!” Their enemies in the north – the Syrians – were going to get it! The people of Gaza in the south, too. After all their years of hassling Israel they were going to get what was coming to them. They were evil people and deserved punishment. For a chapter and a half Amos lays judgment on the enemies of God’s people. But then, in 2:6, he takes what would be an unexpected turn. Using the exact same language that condemned the Edomites, Ammonites and Moabites (read: bad guys) the people of Israel are now put in the crosshairs. I think the “Preach it’s” probably stopped here. It seems in their excitement to see the other teams lose, the Israelites lost focus on their own lives. Do you ever do this? Do you ever get caught up in seeing the wicked be punished that you overlook what is going on in your life? Do you ever catch yourself saying “preach it!” when others are punished while you may be guilty of similar (though perhaps more private) sins? How would God have you react? What are some changes that could be made to your attitude and mindset?